You are here: Home / FREEbies / Sample Showcase – FREEbies! Remember the Sample Showcase I told y’all about a while back? Well, I got mine recently and totally forgot to take a picture or check to see if y’all got yours! Well, one of our readers, Victoria, was sweet enough to send in a picture and her excitement of receiving hers! I received my Sample Showcase Box in the mail April 21, 2011. I was beyond excited when I opened up my mailbox to find this little treasure! I immediately tore in to it! The box was pretty sturdy, and I didn’t want the neighbors to hear the savage noises I was making, so I went inside!! The first thing I found was a certificate stating that I was the First to receive the Sample Showcase. I thought, really, first?? Well, I lifted it out and was amazed at the products and coupons that I received. So far, I have tried all of the samples and have used the GUM coupon. 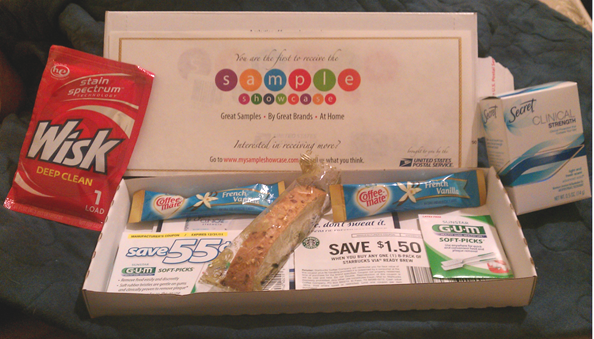 Needless to say, I am going to keep a close eye on the Start Sampling website, in hopes of being eligible for another box! So, did y’all get yours yet? Did you get the same things? i can’t remember if i signed up for this one or not…but i have been getting alot of FREE stuff in the mail…my mailbox at my house and po box have been stuffed. lol thanks so much for the site, i never win anything and i have won two different times on your site. linda maness » You’re very welcome! What and where do I get to the Start Sampling website??? lora » Just click on the first link in the post it will tak you to the post that explains how to sign up for it!